The mission of CMI is to provide a structured and rigorous academic program in which cadets develop as leaders, scholars, critical thinkers and citizens and to instill in young Americans, through a multi-faceted military based cadet program that is physically and mentally challenging and rewarding, the importance of national pride, service to others and maintaining a drug-free and gang-free lifestyle. To be a premier cadet program, noted for its dedication to youth, quality of training and respect for the heritage and traditions of the United States military. CMI seeks to educate students that reflect the diversity of Los Angeles, Orange, Riverside, and San Bernardino Counties. We anticipate that many of our students will qualify for free or reduced lunch. 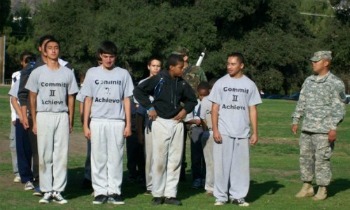 The development of the individual Cadet is the sole purpose of CMI. No aspect of our organization is to take priority over our mission of developing America's youth. We will endeavor to provide a program that is challenging, exciting and rewarding. We will encourage Cadets to test their physical, mental and emotional limits while ensuring a realistic, safe and wholesome training environment. The Officer and NCO Corps exist to serve the Cadets, providing young people the opportunity to learn leadership, self-confidence and patriotism. Cadets will be involved in as much of the day-to-day operation of CMI, at all levels, as is reasonably possible. CMI is a training ground for tomorrow's leaders, and we accept that mistakes may be made in order to learn valuable lessons. Communication is essential to success. All members of the CMI Cadet Corps -- regardless of rank -- are encouraged to communicate openly and honestly, within the parameters of good order and discipline. A public school with a specific college preparatory mission. Open to all families/students committed to our mission/educational vision, without tuition or academic entrance requirements. Rigorous academic curriculum for all students, including English, social studies, math and science. Committed to maintaining high expectations for both academic and personal performance. Structured and rigorous academic program where cadets develop as leaders, scholars, critical thinkers and citizens. Expanded school day and expanded school year (Summer Intercession, Fall, Winter Intercession, and Spring terms) emphasize remediation and enrichment. CMI believes believes that virtually all students, not just a few, are capable of a demanding, rigorous and relevant college preparatory education that prepares them to succeed in college. This view is widely shared by educational and political leaders and organizations such as California Governor Jerry Brown, former California Superintendent of Public Instruction Jack O'Connell, and President Barack Obama. With a clear and focused mission and as a school of choice, CMI will provide a clear choice for students and their families. Students will graduate from CMI prepared for an increasingly competitive global economy, confident that their skills will ensure success in college, trade schools, and the work place. Students whose diversity reflects the community. To be an educated person in the 21st century global economy will require a strong post secondary education. CMI believes that virtually all students, not just a few, are capable of a demanding, rigorous and relevant college preparatory education that prepares them to succeed in college and life. © 2011 - 2019 Centurion Military Institute. All rights reserved.